Growing up, I was never a fan of chili. My family would make large batches of it and I’d always strategically avoid it. I really didn’t like the flavors and I was pretty much anti-anything bean. However, I might touch try it if there weren’t beans but I was never really sure about it. A rather far cry from my current diet which has me eating beans nearly every day! I fell in love with chili later when I attempted to recreate a lost vegetarian chili recipe for my mother that involved bulgur and chocolate. While we never determined if it was close to the one she remembers, it became a favorite/staple of the winter months. However, I don’t always remember to buy bulgur and thus, a no-grain chili was created. This vegan chili is a riff on the flavors of the original bulgur version I developed. However, gone is the bulgur in lieu of beans (and lots of them). I also included a bit of pecan meal in this vegan chili. It’s really subtle but I think it adds an extra layer of warmth and a bit more texture. One note: my husband would look at these photos and think I was in the wrong. I grew up with cornbread while he swears by a peanut butter sandwich with his chili. As far as I can research, it’s a very midwestern thing. However, we’ll have to agree to disagree. 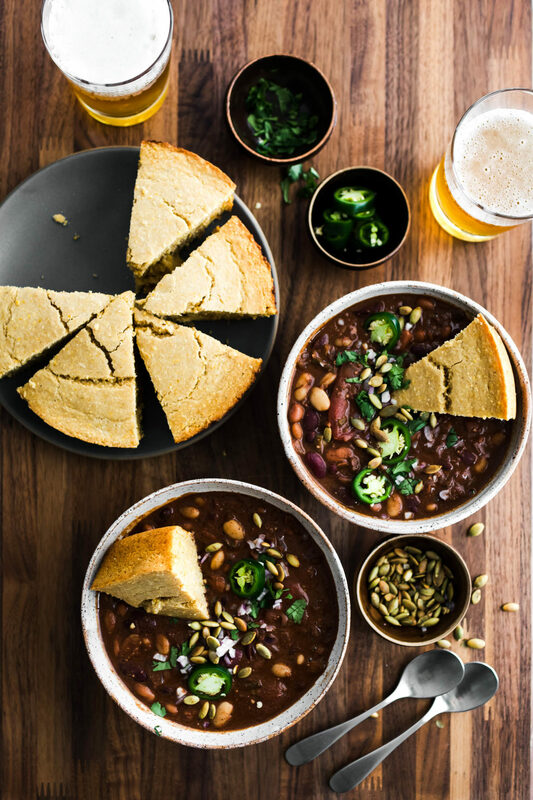 My chili always comes with cornbread! Bulgur/quinoa: As with the original recipe, you can easily add bulgur or quinoa to help bolster this chili. I really love the texture the bulgur adds but with the beans, it doesn’t really need it. Toppings: There are endless possibilities here but a few of my other favorites included minced red onion, pickled jalapeños, cheese, yogurt, sour cream, and hot sauce. Beans: You could easily just use the beans you have on hand. Other varieties of white beans would work, including cannellini or great northern. 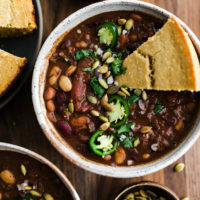 Black beans are also a great addition to this vegan chili. It’s hard to go wrong! ‘Beans’ is pretty broad but this chili has three of my favorites. I keep a small stash of cooked beans in the freezer and a few dried beans in the pantry. 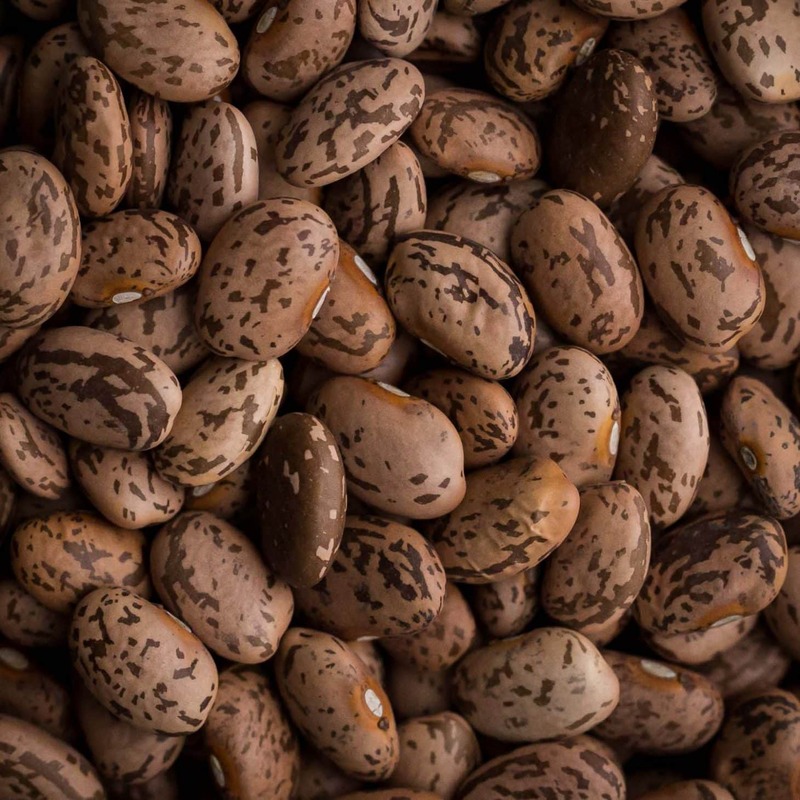 My usage is broad but I love pinto for stews and enchiladas, kidney for toasts and stews, and white beans for dips, spreads, and general bean uses. 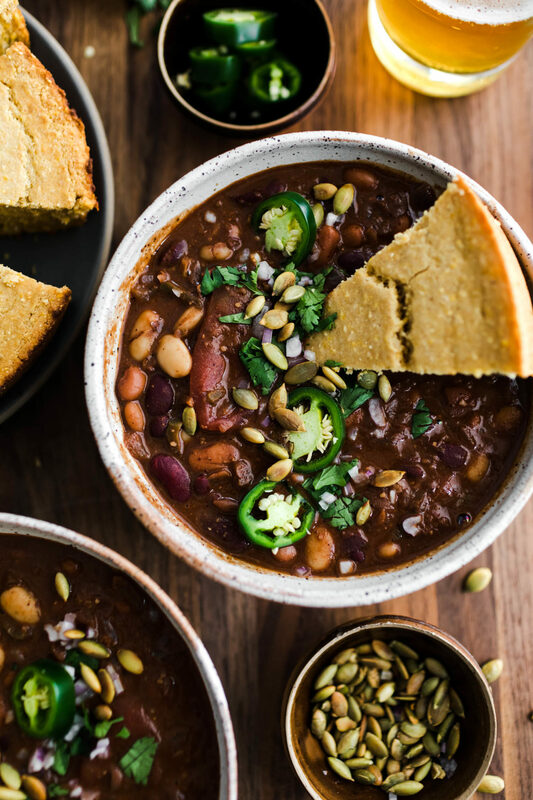 This hearty vegan chili is the perfect rich and filling stew for cold winter nights. Serve with a wedge of cornbread (or peanut butter sandwich) for warming dinner. Chop the onion, garlic, and jalapeño into large chunks. Place in a food processor and pulse until everything is minced. Drain any liquid that may have formed. Heat a stockpot over medium heat. Add olive oil and onion mixture. Cook until onions are fragrant and transparent, 5 to 6 minutes. Stir in spices and ½ teaspoon salt, cooking for 1 to 2 minutes or until you can smell the spices. Add in the tomatoes, chocolate, and 3 cups of the vegetable broth. Bring to a boil, reduce to a simmer, cover, and let cook for 5 minutes. After 10 minutes, stir in the pecans and beans. Cover and cook for another 10 to 15 minutes. Taste and adjust the salt/seasoning. Add more vegetable broth if a thinner consistency is desired. Divide into four bowls and top with your desired toppings. Tips + Tricks: I realize this is a lot of beans but it’s highly worth it. If I don’t have any beans in the freezer, I just go for canned beans. As for the cornbread, I used this vegan cornbread recipe. I had no idea that a peanut butter sandwich with chili is a thing! So weird to me…but also strangely sounds yummy? I’m skeptical but also excited! I’m gonna try it with your chili!! I never had chili until I was a somewhat older adult. I would probably change out some of the beans in this because I don’t care much for kidney beans. I’ve always known cornbread as an accompaniment, never a peanut butter sandwich! I am also very picky about my chili – I get tired of most of the recipes I’ve tried very quickly. But I still try new recipes, always looking for the one I really want to keep. I’m allergic to chocolate, do you think the chocolate is a important ingredient? What would be a good replacement? You could leave it out- it just adds a bit of richness but you could easily do without.